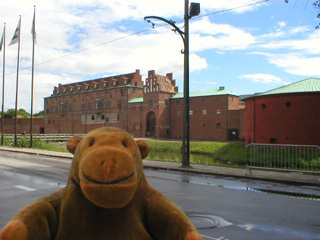 "Painting the whole place orange would be an acceptable compromise, I'm sure"
Mr Monkey examined the Malmöhus from outside, then ran across the bridge into the castle. The low red towers at each end of the castle are sixteenth century artillery positions. 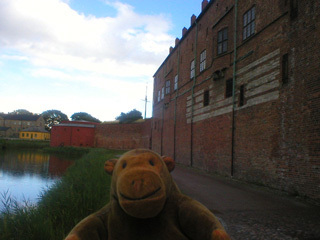 When the castle was expanded between 1536 and 1542, the whole castle was painted this red colour. They can't repaint it all now, because that would cover the white bands of chalk, which were put there as decoration when the castle was originally built by Eric of Pomerania (who was king of Denmark, and Sweden, and Norway, but not always at the same time) in 1434.